Greenville Business & Professional Women’s Club hosted a meeting on April 11. Pictured (l-r) are BPW Membership Committee member Kathy O’Dell, speaker Tammy Dietrich and members Sonya Crist, Kacey Christian and Susan Shields. Not pictured is Holly Lovely. 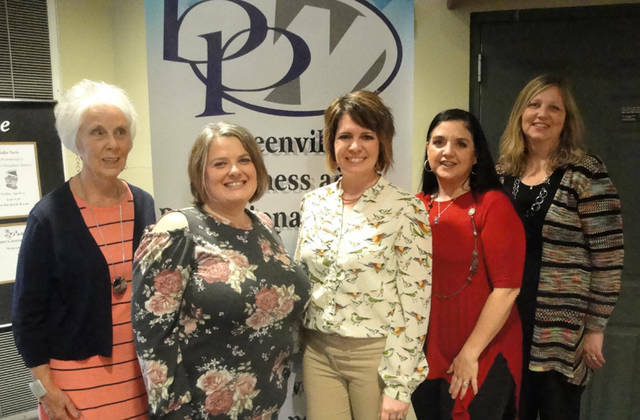 GREENVILLE – The Membership Committee of the Greenville Business & Professional Women’s Club hosted the April 11 meeting, which was held at the Brethren Retirement Community. The committee consisted of Sonya Crist, Kathy O’Dell, Susan Shields, Kacey Christian, Tammy Dietrich and Holly Lovely. Committee Chair Sonya Crist introduced the featured speaker, Tammy Dietrich, who is an executive sales leader as a Norwex independent sales consultant. Dietrich is passionate about helping people make their homes safer and healthier by removing toxic chemicals. Norwex was started 25 years ago in Norway. Dietrich said most store bought cleaners include synthetic fragrances, which is a combination of chemicals that can be carcinogenic. Stabilizers are included in the formulas to promote longer shelf life. Dietrich performed demonstrations utilizing the Norwex micro-fiber cloths from removing butter on windows to germs revealed by a black light on a piece of wood. Dusting micro-fiber cloths, dust mitts, a mop system and a body line cloth that requires no soap were exhibited. Dietrich is wife to Jeff and mother of four children. For further information on Dietrich, find her at www.tamarahdietrich.norwex.biz. Author Jodie Bohman was present at the meeting promoting and autographing her books “Mattie” and “I Believe.” Bohman was a featured speaker at a prior BPW meeting. Her website is jodierichardbohman.com. The club is promoting its chicken barbecue fundraiser, which will be held from 4:30-6:30 p.m. June 19 at the VFW on Ohio Street, Greenville. The price is $7.50 and includes one half barbecue chicken, applesauce, chips and a roll. Tickets can be purchased from any BPW member, at the Merle Norman Studio, 309 S. Broadway, Greenville, or by calling Debbie Niekamp at 419-305-2178. Information on BPW can be found at the website www.bpwohio.com. Those interested in learning more about the club can contact Membership Chair Sonya Crist at 937-423-3657 or through sonyacrist@gmail.com.